The people of Sandy Ground built one of the only free black communities to exist in the early 1800s. Oyster gatherers, such as these from Maryland, helped the community grow. The Sandy Ground Historical Society Museum and Library is located at 1538 Woodrow Road. Here, one can explore the culture and history of this free black community. 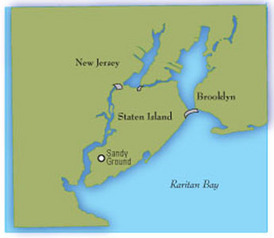 On February 23, 1828, Captain John Jackson purchased land in a place known as Sandy Ground on what is now Staten Island. He was the first African American known to own property on Staten Island. When other freed families followed him, the rural village became something incredibly rare in the nation--a free black community. It was called Harrisville at first, and then Little Africa, and finally Sandy Ground. It was mostly a farming community until 1841, when oyster gatherers, fleeing violence in the Baltimore area, arrived. 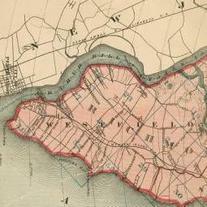 The town was located on the southwestern shore of Staten Island, and rich oyster beds were within walking distance. The community grew into a place of well-maintained homes surrounded by fenced cropland. The Zion African Methodist Episcopal Church, built in 1850, became the center of the community and probably a major stop on the Underground Railroad. There was a Sandy Ground School, and in 1855, the Union Free School became the second public school on Staten Island to accept black students. Today, descendants of Sandy Ground settlers still worship at the African Methodist Episcopal Zion Church. The neighborhood is listed on the National Register of Historic Places, and visitors can view a collection of photographs, letters, quilts and other artifacts at the Sandy Ground Historical Society Museum and Library. 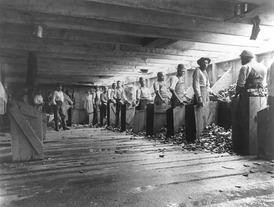 Photo of Oyster Workers, 1894.